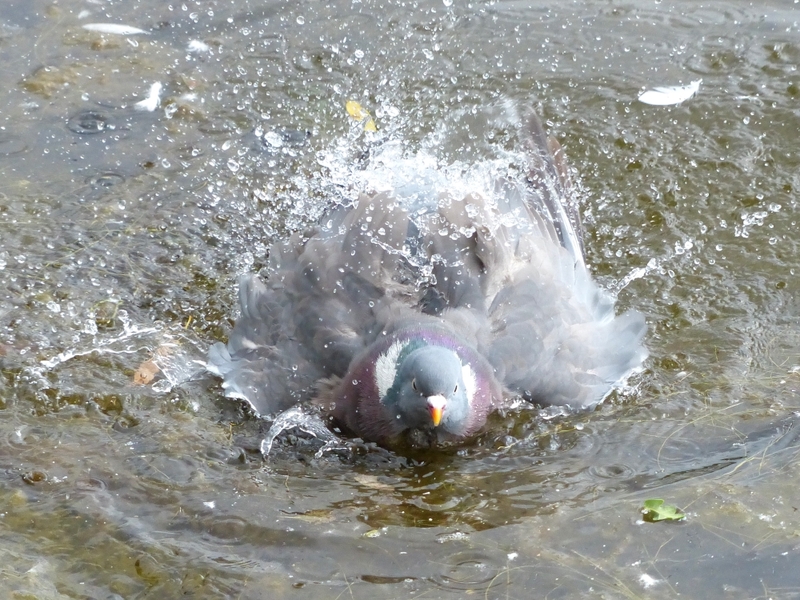 A quiet midsummer day, and just the usual sights of the park birds getting on with their lives. A Wood Pigeon was splashing vigorously to wash the parasites out of its feathers. A Great Crested Grebe was preening the shining white feathers on its underside. The whiter the feathers, the less the bird is visible from below when it is on the surface, allowing it to get closer to an unwary fish that will be its next meal. 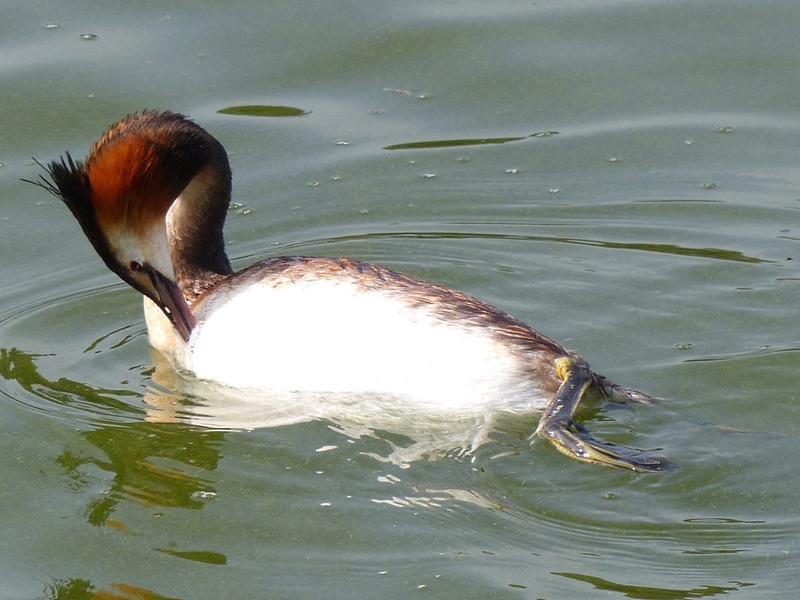 Grebes seem to deliberately make themselves less noticeable by other means, such as mingling with a crowd of ducks and geese which present no threat to fish, and then unexpectedly diving out of their midst. Pairs of grebes have other techniques for improving their chance of a catch, such as diving side by side a couple of yards apart to push fish into the space between them, or retreating some distance apart, diving simultaneously and converging to produce the same result. Some of the Mute Swan cygnets were upending themselves to feed in the shallow water at the edge of the lake. 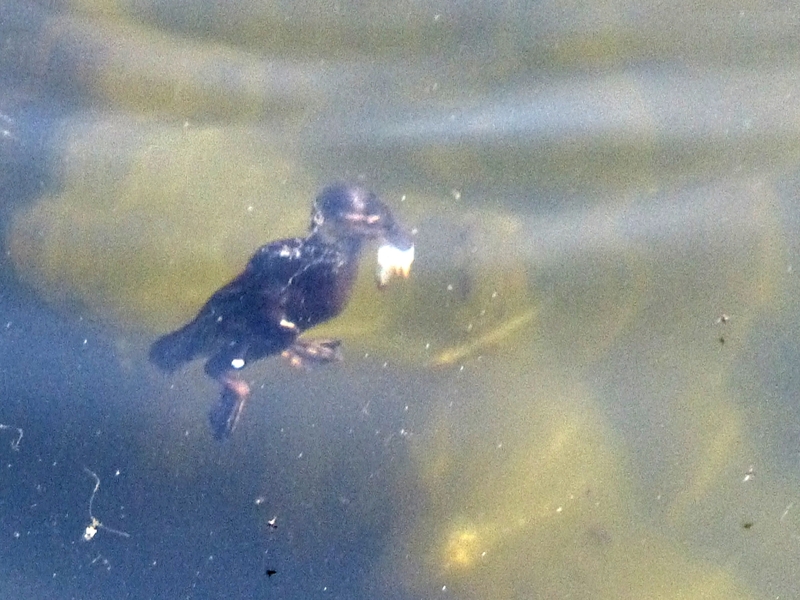 But a week-old Mallard duckling was showing much greater enterprise in one of the ponds in the Italian Garden, repeatedly diving to the bottom -- the water is about 5 ft deep. Here it is coming up after retrieving a piece of biscuit that had sunk. There were at least 50 Black-Headed Gulls on the Long Water. At this time last year, only a handful had returned. So in a year when everything else has been running very late, these gulls are back early. Possibly they are birds that have failed to breed because of unfavourable weather conditions earlier. Certainly they are all adult birds; not a single juvenile has shown up yet.